A reasonable question and well, yes, it is supposed to be lying down actually. Strange as it may look, it was fully intended and the technical term is “heeling in” (honest, I’m not making this up). We picked up a bargain apple tree plus a plum tree yesterday while we were supposed to be shopping for mundane items like eggs and cheese. Being such a bargain they were supplied bare root i.e. lifted from the field whilst dormant and not potted up in a nice container, the roots just wrapped in a bit of plastic instead. After we’d got them home and the excitement of finding such a great bargain had subsided, the reality set in. The space intended for the apple tree at the allotment wasn’t ready (covered in weeds), it was trying to snow and I didn’t have a tree stake or a tree tie. 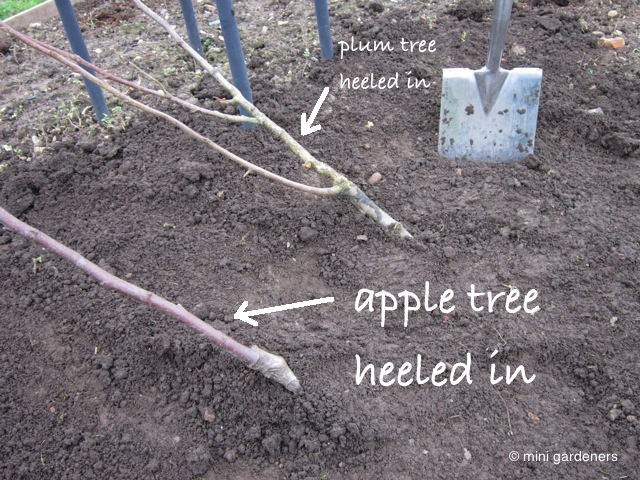 Oh, and bare root trees need to be planted almost as soon as you buy them otherwise the roots can dry out and the tree can die. Luckily I just happen to know there is a short term fix to prevent tragedy – heeling in. This stops the roots from drying out until you’re ready to plant properly. It’s only supposed to be short term – a week or two – although I have previously had raspberry canes heeled in for a year during one of my less organised periods. 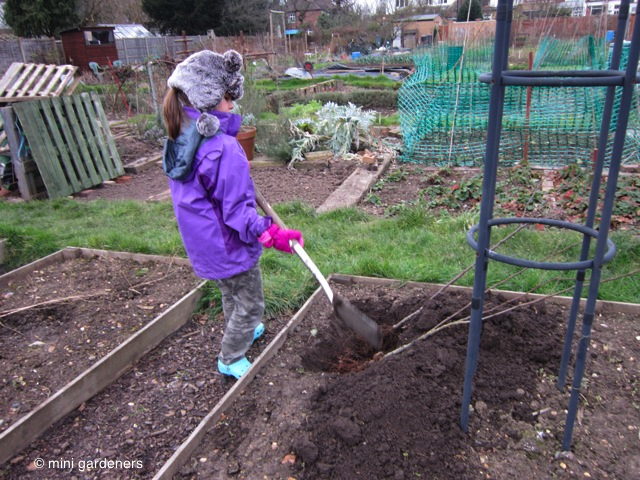 So, with my little helper, we dug a small trench in an unused bed at the allotment and placed the trees in, lying them on their side as if they were about go to sleep. Then we refilled the trench and firmed the soil to avoid any air pockets. I’ve never been totally sure why you lie trees on their side when heeling in. I originally thought it was so you’d remember it was only temporary because they do look faintly ridiculous. But I suspect there’s a more scientific explanation in that it stops wind rock because the tree isn’t yet staked. Categories: apples, trees | Permalink.